Somacoma is a Legacy Library. Legacy libraries are the personal libraries of famous readers, entered by LibraryThing members from the Legacy Libraries group. » Aldous Huxley's legacy profile. Somacoma is also an author. 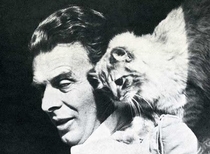 » See Aldous Huxley's author page. About meAldous Leonard Huxley (1894-1963) was a British-born fictionist, philosopher, and essayist. Born under the Godalming, Surrey sun on July 26th, 1894, Huxley slammed into the world with a genetic jackpot. His father, a gifted schoolteacher and writer, was the son of biologist Thomas Henry Huxley, also known as "Darwin's Bulldog" for his avid (and sometimes choleric) support of Darwin's theory of evolution. Huxley had three brothers, one of whom sadly committed suicide owing to clinical depression. His other two brothers became accomplished biologists, most particularly, Sir Julian Sorrell Huxley, an evolutionist. Huxley carried on the familial tradition of fine, clear, brilliant thought, and turned his attentions to humanism, not unlike many of his relatives. Huxley explored dystopia, fascism, runaway science, mysticism, and psychedelic experimentation, his studies and thoughts leading to gorgeous and horrifying satires. Scathing as they were, Huxley found himself both lauded and hated for his beliefs. Although he never came close to being exiled from his home country, like the dystopian satirist Zamyatin, he was, nevertheless, a victim of book bannings and the like. Huxley moved with his then-wife Maria to Los Angeles in 1936, and lived there until the time of his death on November 22nd, 1963. He survived his wife Maria, who was taken by breast cancer in 1955, and remarried Laura Archera, who died in 2007. Huxley taught George Orwell French at Eton College; he was known as a brilliant but horrid schoolmaster, who couldn't keep order. Huxley had a dalliance with Medicine, but a rare condition that blinded him for a handful of years made this inconvenient for him; he became a writer instead. Huxley had dinner with Aleister Crowley in October of 1930, and it's believed that Crowley introduced Huxley to peyote on that occasion, perhaps leading the way for Huxley's famous experimentations with psychedelics later on. About my libraryAldous Huxley's library was mostly decimated during a house fire in 1963. In 2009, UCLA acquired his literary archive. This shall be my starting point in the Somacoma: Aldous Huxley's Reading Room project.